Q. Last summer my neighbor's 85-foot-tall oak tree fell into our yard, crushing some treasured ornamentals and a retaining wall. 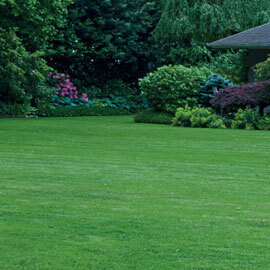 By the time we sorted out the removal, a month had passed and the lawn was a mess. Much of the grass had been killed by the large crown falling onto it; and the coup de gras was delivered by the weight of the heavy equipment that had to be brought onto the lawn. The arborists did what they could to lessen the impact, putting gigantic sheets of wood under the crawlers and wheels, but large areas were still badly compacted. After a rainstorm, water pools for hours. The lawn is pretty much now total weeds and will need to be redone—but first we need to address the compaction problem; correct? I consulted the 'soil compaction' article in your A to Z archives and feel that core aeration would only provide superficial help. Now—I do not agree that core aeration would provide only 'superficial' help. But before we get to that, let's discuss core aeration in detail. It's an important tool in organic lawn care that's often misunderstood or overlooked, but that has great potential to improve your turf. Now: It sure sounds like a technique this severe would be stressful to the lawn—and it is. We're talking risk and benefit here. And the benefit is immense—compacted soil is probably the second biggest cause of plant death (after incorrect watering, which will always be #1). 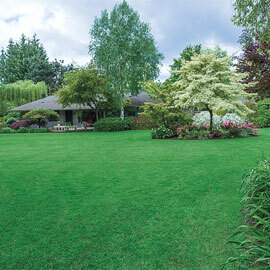 To lessen the stress on the lawn, you should only perform a core aeration when your personal turf is at its strongest—that's late summer/early fall for cool-season lawns of fescue or bluegrass and late spring for warm-season lawns like St. Augustine, Bermuda, Centipede and zoysia. That's normally. In this case, it sounds like there isn't much lawn left to stress. So they could have the aeration done in the summer—really anytime the soil is bone dry (which is important for long-term success; never aerate sod while its actually soggy). But people rarely plan for the amount of time that proper preparation takes, so even if they know the right timing, its often October before the seed actually goes down. That's better than Spring seeding, but you really want to hit that perfect window of mid-August through early-September. As our old pal Dr. Nick Christians of Iowa State University has often said, "you can make quite a few mistakes and still have a great-looking lawn if you seed at the correct time of year". But Carol doesn't have to wait if she chooses to lay new sod instead of waiting for seeding-time. (Cool-season seed should be sown in late summer, but you find the highest quality sod for sale in the Spring.) Her neighbor's homeowner's insurance should be compensating her for her losses in plants and wall, and that compensation should include lawn replacement. Carol just needs to convince them to agree to pay for sod instead of seed. And to install sod correctly, you have to remove several inches of old soil to make sure the new turf is level with the surrounding areas (because the sod already has several inches of height). That chore alone will greatly reduce some of the compaction. So: Excavate some of the old compacted soil, till the area underneath to loosen up the sub-soil, and then install the new sod on top. Compaction cured. Instant lawn.